It’s a well-known fact that William Shakespeare married Anne Hathaway in November 1582. What fewer people know, however, is that just days earlier a marriage licence had been issued to William Shakespeare and Anne Whateley of the village of Temple Grafton. Historians are divided over whether Shakespeare was actually involved with two separate women or whether the first entry in the parish register was a simple clerical error. 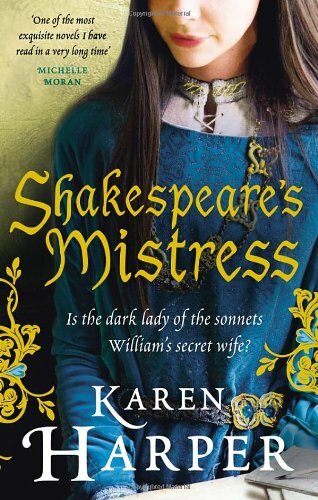 In Shakespeare’s Mistress Karen Harper takes this as a starting point to explore Anne Whateley’s life and the influence she may have had on Shakespeare’s work. Anne is portrayed as the woman Shakespeare truly loved while the other Anne, Anne Hathaway, is the one who is recognised as his legal wife. The novel is narrated by Anne Whateley and divided into five ‘Acts’, like one of Shakespeare’s plays, and it really is a fascinating, entertaining story. As well as following the turbulent romance between Anne and Will (as he is referred to throughout the book) we also meet a host of other figures from the Elizabethan period including Queen Elizabeth I, Christopher Marlowe, Henry Wriothesley, John Dee, Richard Burbage, Sir Walter Raleigh and Lord Strange. The story is played out against a backdrop of historical events: an outbreak of the plague, Christopher Marlowe’s death, the defeat of the Spanish Armada, the funeral of Elizabeth I and the building of the Globe Theatre. The book appears to have been very well-researched and I appreciated the author’s notes at the end as it’s always helpful to have an idea of which parts of a novel are based on historical fact and which are completely fictional. I enjoyed reading all the scenes in which Will and Anne are going through the creative process of writing and staging his famous plays – a knowledge of Shakespeare and his writing is not essential, by the way, but would probably help. Karen Harper has also done a good job of attempting to show how Anne could have been the inspiration behind some of Shakespeare’s work but I was less convinced by the way the characters were constantly dropping lines from Shakespeare’s plays and sonnets into their conversations. It seemed forced and unnatural, particularly when Anne and Will kept speaking to each other in rhyming couplets! The dialogue, in general, has a modern feel, though it’s interspersed with words like ’twas and ’tis, in an attempt to make it more authentic. The language wasn’t always quite right but it didn’t feel ridiculous (which is always a danger with dialogue in historical novels) and I didn’t have a problem with it. I did enjoy both this book and also Karen Harper’s The Queen’s Governess, which I read a couple of months ago. I really like the fact that with both novels she has found a way to approach the Tudor period from a fresh and unusual perspective. I think I would put her books on the same level as Philippa Gregory’s, so if you like Gregory’s historical fiction I would recommend trying Harper’s too. For anyone interested in learning more about Anne Whateley, this website discusses the various arguments for and against her existence. It was fascinating because I had no idea there was a mystery surrounding Shakespeare’s marriage. I like to think Anne Whateley did exist, but I suppose we might never know for sure.